An essay on Tim Burton’s disastrous reimagining of Dark Shadows and the lessons he has failed to learn from the original series. Tim Burton is little more than a soulless businessman who makes movies as cutting-edge as crucible steel. His films haven’t been fun or worthwhile in quite some time, an especially astonishing accomplishment considering the eye-popping work that came before. He’s been lurching around like a creatively bankrupt whore for at least sixteen years and his chief skill seems to be taking very fun films from decades past (Planet of the Apes, Willy Wonka & the Chocolate Factory, et al.) and adulterating them into tepid remakes which rival Sátántangó in sheer soporificity. Tim Burton is not a man who dazzles, but he is very keen on taking your money and boring you to tears. 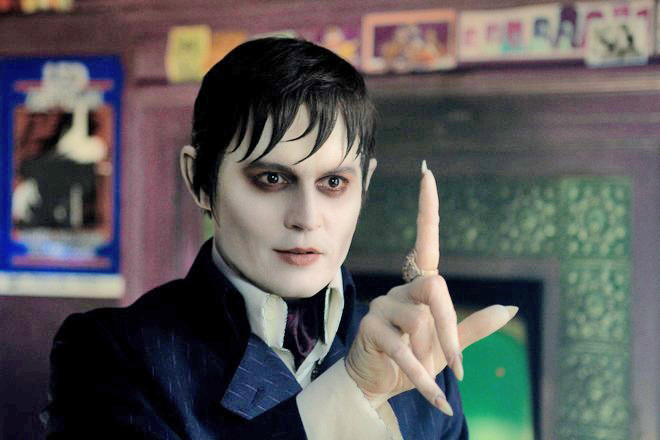 With his latest disaster, Dark Shadows, Burton has once again butchered an engaging antecedent. He has hired Seth Grahame-Smith, an in-it-for-the-money mashup charlatan who wasn’t even alive when the first Dark Shadows series aired, to write a porous screenplay built upon gags so bad that even a Marmaduke fan is likely to go postal. Instead of establishing Barnabas Collins’s striking qualities as a tormented vampire, Burton and Grahame-Smith cheapen him by having Barnabas react to cultural developments (“They tried stoning me. It did not work,” replies Barnabas when someone asks if he is stoned: no one in the theater laughed), having Dr. Julia Hoffman (played here as a clueless chain-smoking drunk by Helena Bonham Carter) go down on Barnabas because Burton and Grahame-Smith couldn’t ken the character (played by Burton’s real-life wife!) in any other way*, and having Barnabas quote from The Steve Miller Band’s “The Joker” (which actually came out in 1973, one year after the movie’s setting) and Erich Segal’s Love Story in an effort to relate to hippies. And I put forth to any self-respecting moviegoer that when a character is forced to exclaim “You’re way too weird!” to another in a movie, as one does to Barnabas, this is probably happening because the writer and the director are incapable of establishing the weirdness through action. So if you’re going to compress a series this complicated and this distinct into a two hour movie, you need dedication and finesse, especially if you hope to attract a new audience. But Burton and Grahame-Smith are so laughably amateurish that Barnabas walks around town in open daylight with little more than a hat and an umbrella to protect him. (Indeed, after the fifteenth time I noticed some stream of sunlight that should have killed Barnabas, I stopped counting.) And unlike the Frid or Cross exemplars, who both used their innate charisma to persuade, Barnabas relies mostly on his hypnotic powers to coax others to do his bidding. As the wonderful bar scene from Near Dark demonstrated, a vampire is only as badass as his actions. Tim Burton’s Barnabas comes from a soft, privileged, and unlived place. In addition, the movie is needlessly aggressive in its use of obvious music cues — The Carpenters’s “Top of the World,” The Moody Blues’s “Nights in White Satin,” Barry White’s “You’re the First, My Last, My Everything,” many others — to telegraph its hackneyed moments. One almost expects Casey Kasem to show up. Instead, we get Alice Cooper performing at Collinwood, the Collins family manse that was so enticingly mysterious in its two television incarnations. For Burton, Collinwood is merely a place where you stash your badminton and macramé supplies in the secret rooms. If turning a secret room into storage space for a Veblenian haul is Burton’s idea of imagination, then it’s clear that this rabid bore should be taken to the woodshed. The man contributes nothing of value to the American cultural landscape. He may look like Ichabod Crane, but he lost his head for fun a long, long time ago. * — To give you a sense of how Burton and Grahame-Smith have diminished Dr. Julia Hoffman, here’s an extremely abbreviated character history from the original series. She was the head of a sanitarium, pretended to be a historian to infiltrate her way into the Collins family, and discovered Barnabas to be a vampire through her own initiative. Barnabas and Julia developed an interesting relationship that was built on trust, hypnosis, blackmail, and near murder. Should such an intriguing character really be little more than a drunk?